At the time of its introduction, the Sikorsky S-56 was the largest and fastest military helicopter in the Western world. In 1956, the helicopter set two height-with-payload world records and one world speed record. The S-56 was also Sikorsky’s first multi-engined helicopter and remains the largest piston-engined helicopter ever built. CH-37B Mojave in flight. The screen on the side of the engine nacelle to maximize engine cooling is visible. The S-56 was powered by two Pratt & Whitney R-2800 air-cooled radial engines with a takeoff rating of 2,100 hp (1,566 kW) and a cruise rating of 1,900 hp (1,417 kW). R-2800-50 engines were initially used, but late production aircraft used R-2800-54 engines, which had upgraded magnetos and additional mounting studs. The engines were connected to the main rotor’s transmission via a hydro-mechanical clutch. This clutch allowed the engines to run independently from the main rotor for starting or in the event of an engine failure. Power for the tail rotor was taken off the main transmission. Unlike most heavy lift helicopters, the engines were not located in the upper section of the fuselage. Instead, each engine was housed in a nacelle fixed to the end of a short shoulder-mounted wing on each side of the helicopter. The engine nacelles also accommodated the machine’s fully retractable, twin-wheeled main landing gear. The S-56’s engine arrangement allowed for an unobstructed cargo bay of nearly 1,500 cubic feet (24.5 cu m)—large enough to carry three Jeeps, 24 stretchers, or up to 26 fully-equipped troops. The cargo bay measured 30 ft 4 in (9.2 m) long, 7 ft 8 in (2.3 m) wide and 6 ft 8 in (2.0 m) high. The S-56’s nose section was equipped with large clam-shell doors which allowed vehicles to be driven straight into the cargo area. The cockpit was placed above and slightly aft of the doors to ensure good visibility. The single main rotor was five-bladed and designed to sustain the aircraft in flight with one blade shot away in combat. For storage, the helicopter’s main rotor blades folded back along the fuselage and the tail rotor mast folded forward. Head on shot of the CH-37 with the clam-shell doors open and distinctive engine pods visible. Sikorsky originally developed the Model S-56 in response to a 1950 Marine Corps requirement for a heavy-lift assault transport able to carry 26 fully equipped troops. In 1951 the Navy ordered four XHR2S-1 prototypes for USMC evaluation, and the first of these made its maiden flight on 18 December 1953. In 1954 the Army borrowed one of these pre-production machines. Re-designated YH-37 Mojave, it was subjected to rigorous evaluations before it was returned to the Marines. Based on the helicopter’s excellent showing during the Marine and Army evaluations, Sikorsky was awarded a contract for 55 HR2S-1 for the Marines, who nicknamed the helicopter Deuce, and 94 H-37A Mojaves for the Army. The H-37A was delivered to the Army during the summer of 1956, at about the same time the HR2S-1 naval variant was entering regular Marine squadron service. The Marines set three world records for helicopters in November 1956 when a HR2S-1 carried an 11,050 lb (5,012 kg) payload to an altitude of 12,000 ft (3,658 m), carried 13,250 lb (6,010 kg) to over 7,000 ft (2,134 m), and set a three kilometer speed record of 162.743 mph (261.910 km/h). All aircraft were delivered to their respective services by May 1960. In 1961 Sikorsky began converting the Army’s H-37As to B model standards. The upgrade included the installation of automatic flight stabilization systems that gave the H-37B the ability to load and unload while hovering, crash-resistant fuel cells, and modified nose doors. All but four A models were eventually converted. In 1962 military aircraft designations in the United States were unified, and the H-37A were re-designated CH-37A; the modified B machines became CH-37B, and the Marine’s HR2S-1 became CH-37C. Three CH-37C Deuces on a carrier deck. The hole on the front of the engine nacelles is the air intake for the R-2800 engine. The S-56 was developed just prior to the widespread adoption of the turbine engine as a helicopter powerplant. As a result, the type was forced to rely on larger, heavier, and less powerful piston engines. Even so, the S-56 ultimately proved to be a more than capable heavy-lifter. In June 1963, four CH-37B Mojaves were temporarily deployed to Vietnam to recover downed U.S. aircraft. By the following December, the Mojaves had recovered an estimated $7.5 million worth of equipment. Most of the recoveries were sling-lifted out of enemy-held territory that was virtually inaccessible by any other means. In September 1965 a Marine detachment of eight Deuces was sent to Vietnam for general transport duties in support of Marine Air Group 16 at Marble Mountain. Although this detachment had only ten pilots for eight aircraft, they flew about 5,400 hours in 1,500 missions, hauled more than 12.5 million pounds (5.67 million kg) of cargo, and transported some 31,000 passengers without an air accident. 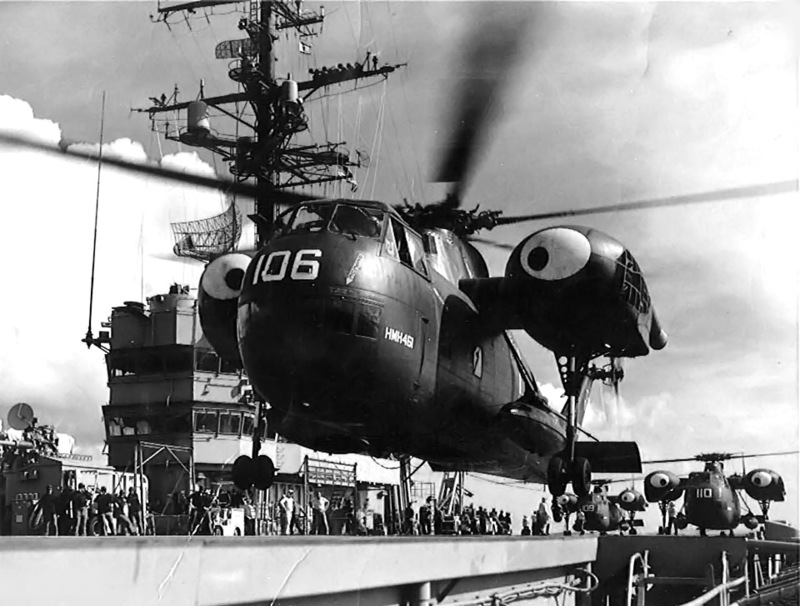 The Mojave did not see more extensive service in Vietnam primarily because of its replacement by the turbine-powered Sikorsky CH-54 Tarhe (S-64 Skycrane), a machine that weighed slightly less than the CH-37 but could carry nearly four times as many troops or five times as much cargo. In addition, the R-2800 engine was very loud, created a lot of vibration, and required much more maintenance than a turbine engine. 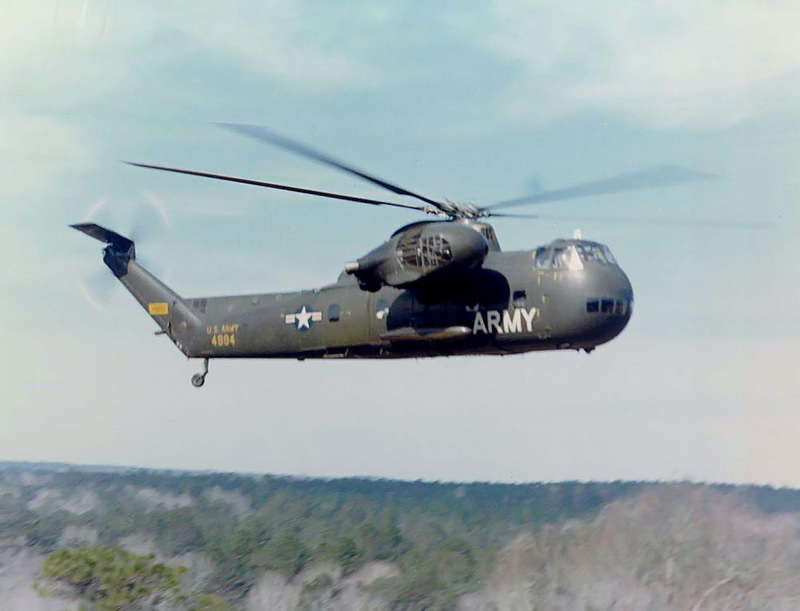 The last CH-37 was withdrawn from Army service in the late 1960s. The Marine’s Deuces were replaced by CH-53 Sea Stallions in 1967. 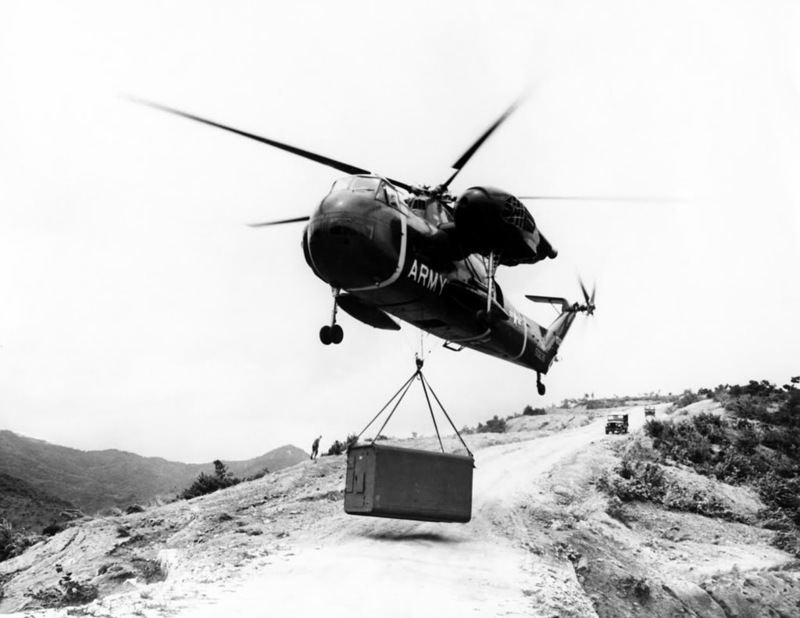 When built, no helicopter could surpass the CH-37’s lift capacity. This entry was posted in Post World War II, Rotorcraft on 4 September 2012 by William Pearce. The S-56 also served as the first airborne early warning helicopter. Two were built for the Navy and designated HR2S-1W. An AN/APS-20 radar set was mounted in the cargo bay with the radome replacing the cargo doors. One item and one question: 1) in early 1964 an H-37 came to Vinh Long RVN to recover a Grumman Mohawk that crashed a few miles away. While hooking up the Mohawk fuselage the H-37 was shot down. I believe the entire crew was KIA. Two Hueys went out and recovered what remained of both the H-37 and the OV-1. 2) the question: was there ever any attempt to replace the R-2800s with turboshaft engines? Thank you for your comments. I have not seen anything about powering the S-56 with turbines. 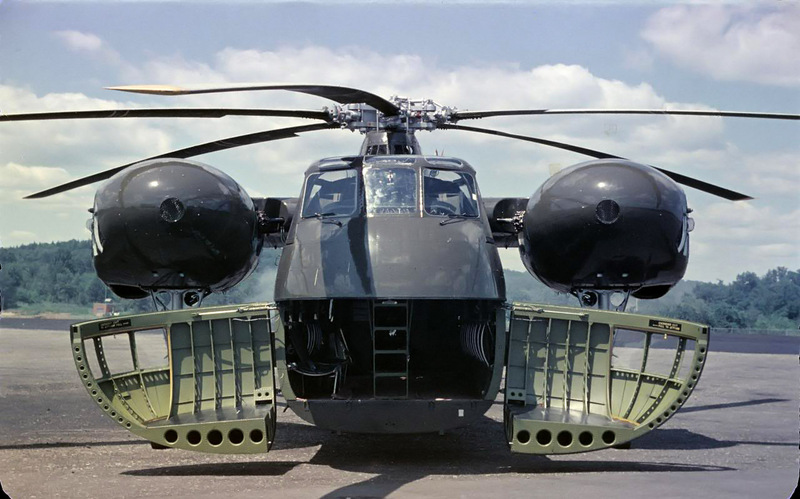 Sikorsky had a lot of projects at the time, and I think any turboshaft model would have just been a complete redesign rather than a conversion. No, but the prototype piston-engined S-60 Flying Crane incorporated the S-56/CH-37 drive train and rotor system and the replacement turbine-engined CH-54 Skycrane incorporated some of the CH-37’s dynamic components. So, some legacy CH-37 parts made in into the CH-54.